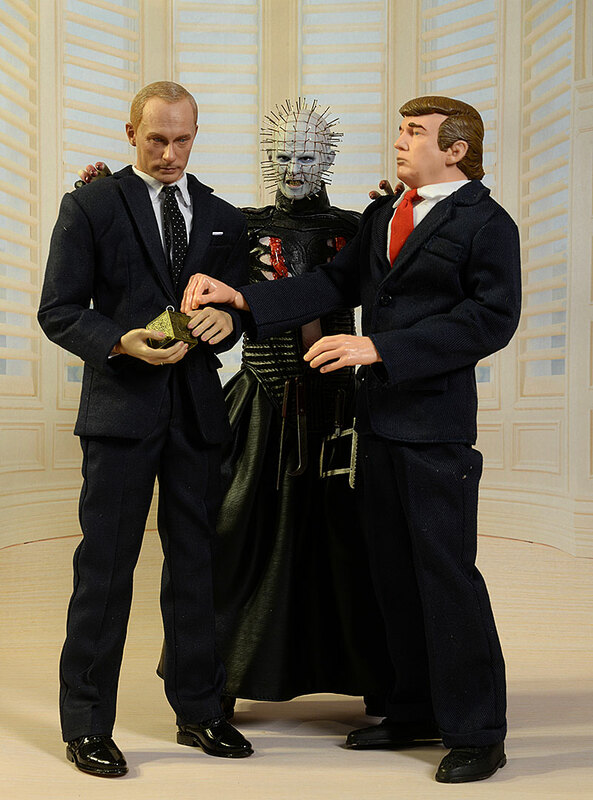 Ah, Pinhead, a classic of modern horror, a magnificent creation by Clive Barker, but a figure that has been sadly overlooked in sixth scale. There's been a few attempts of course, and recently Mezco released a version in that general size range, but as a vinyl figure. 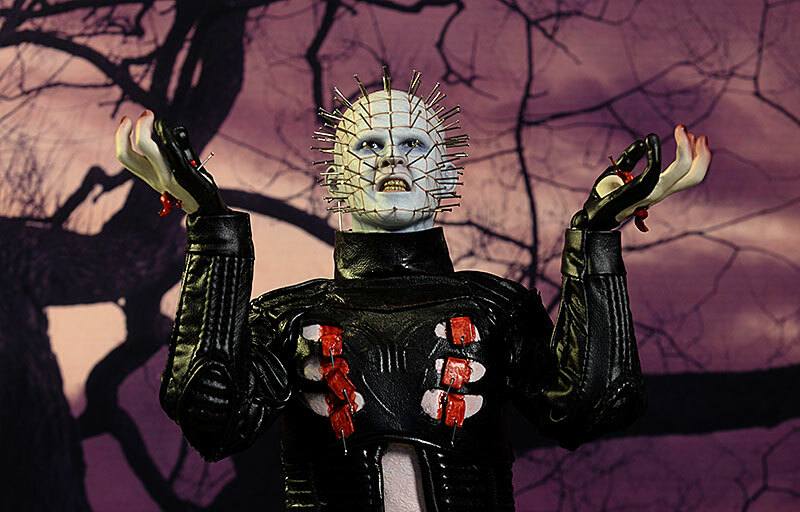 NECA has certainly done some great versions in larger and smaller scales, but most collectors of 12" clothed horror figures have had to turn to customs to get their Hellraiser fix. 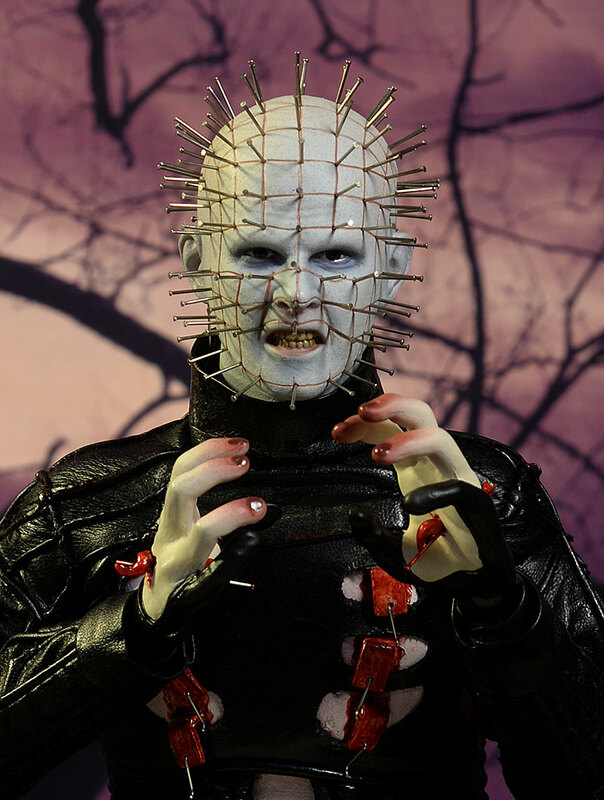 ThreeZero has stepped up to the plate and answered the call with their newly released Pinhead based on his look in Hellraiser III. The figure has just started shipping in the U.S., and will run you around $190 or so, depending on the retailer. 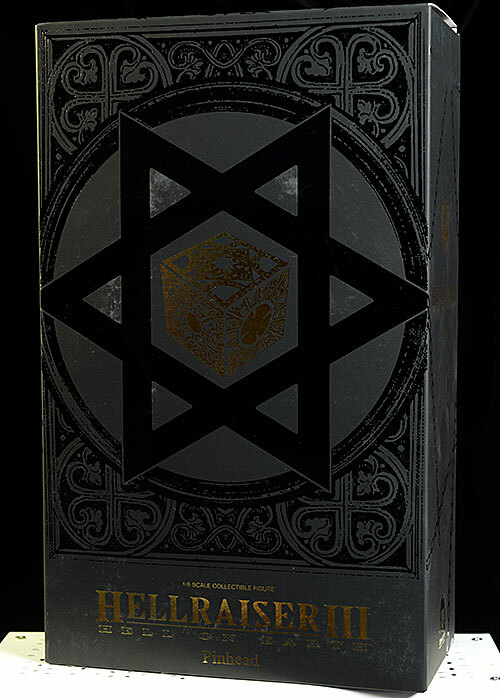 The outer box has some nice graphics, mirroring the look of the Configuration, with gold foil style lettering. Mine was pretty worn though, and the box cardboard is a bit on the thin side. Inside is a single tray that contains the various accessories and the figure itself. There's some plastic wrap on the hands and feet, a common technique these days, but it's wrapped very tightly and taped, which means you'll need to cut it free. When it comes to the portrait, getting it to look exactly like the actor is not the major problem with this character. 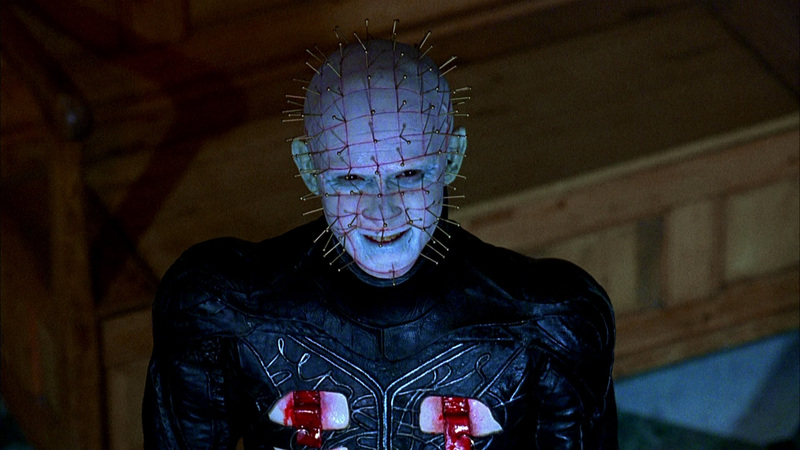 Doug Bradley, long time friend of Barker, has played the Captain Cenobite in eight films, including Hellraiser III. They've done a fine job capturing his bald look, with a proper shape to the eyes, nose, mouth and head. The carved lines look good, and the expression, with gritted yellow teeth, works with a number of poses. A little more evil in the eyes would have been great, but it's a minor nit. There's also a nice texture to the skin, including both the head and the chest. My one complaint is with the flaps of rent skin on the chest, which look less like skin and more like chunks of plastic attached to the front of the body. 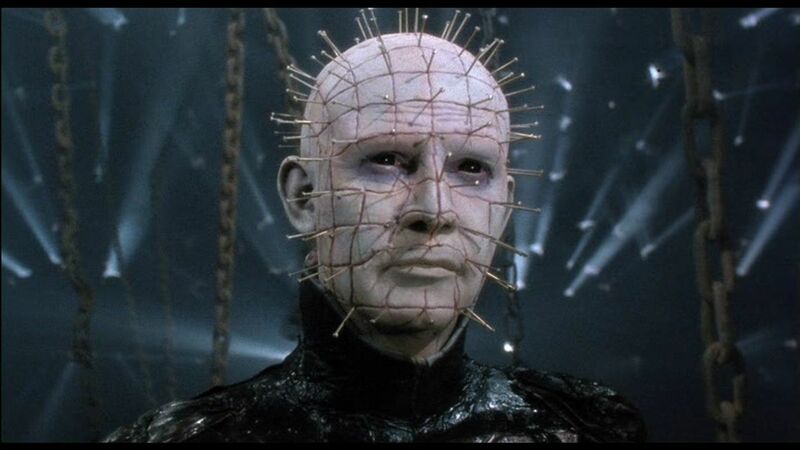 The pins are real metal, just like the ones in his head, but the flaps themselves are a little too thick and large. The major problem has always been those damn pins. It's hard to get something that is properly in scale, and not too weak and tiny. It's not like they were that small in real life, but they are invariably over sized when done in smaller scales. I'd say that ThreeZero has done an admirable job getting them much closer than I've seen before. The thickness is about perfect, and while they'll look a *little* long in macro photos, in hand they look terrific. They are also very sturdy, real metal pins, and I never felt as though I was about to bend or damage them while working with the figure. Along with the chunky chest wounds, the other minor issue that pulled him down slightly is the three metal hooks in back that go from the skin to the suit. These greatly limit the neck articulation, but you can easily remove them from the head, allowing you to tilt and turn into various poses. I did find that once I had them unhooked, getting them hooked well enough to stay was a problem. The five hands are sculpted to work with the accessories and a variety of poses, and the scale is relatively decent. The sculpt here is a little clunky and cheap looking compared to the portrait, but they're workable. He stands about 12" tall without the pins. The off white skin, blue around the eyes, and the yellowed teeth - especially the teeth - look fantastic. The eyes could use a little more life to them, sort of an ironic thing to say about this character, but overall the work is clean. The blood effects on those damn chest flaps pull this score down as well. Not only is the sculpt in this area weak, but the paint has that very...well...paint-like quality to it, losing a lot of the realism. There's some additional blood around the fingernails, and it's not any better. I already mentioned the issue with the head, and removing the back hooks goes a long way to improving the situation. I also managed to pop the head off while I was working with him, but by gripping the head tightly at the ears, I was able to force it back on. The underlying body is much like previous ThreeZero releases. The hands all include their own wrist pegs, and swapping is quite easy. The leather costume does restrict the shoulders and elbows a bit, but far less than I expected. The torso doesn't have much mobility, thanks to the sculpted chest plate, but the legs under the skirt have a good range of movement at the hips and knees. He is wearing tall, solid boots though, and these take away any sort of ankle articulation other than a simple turn. Even with a couple restricted areas, you should be able to get some great Cenobite poses out of him, and the joints are tight enough to hold normal stances for the long term. He doesn't have a ton, but he does have his key extras. There are five hands in total. He comes wearing a set of relaxed palms, and you can swap in the other set, pierced with a metal pin and oozing all sorts of grossness. The fifth hand is a left, sculpted to grip the Lament Configuration. This box is properly in scale, and sculpted with accurate designs. I do wish they'd included both an open and closed version, but you only get the closed. He wouldn't be Pinhead without his tools of the torture trade, and there's the long, thin blade, square saw, and long blade with the rounded tip. These attach easily to the rope around (and through) his waist. One nice touch is a small bag of extra pins, just in case. I tried pulling out a pin - gently - to see how tough it would be to swap, and it didn't loosen up a bit, but having the extras does allow for you to repair any serious damage, perhaps from a long fall off a shelf. That's it - no stand of any kind, but that's been the case with all the ThreeZero releases. You can always swap in a black no brand stand for consistency. The pleather outfit looks terrific, with lots of detail work in the pleating and padding. There's different textures to the various pieces, and they blend together to create a terrific looking costume. Under the long skirt is a pair of black pleather pants too, nicely tailored and stretchy enough to allow for good hip and knee mobility.The sleeves are a little short, but if you pull them all the way down to cover the wrists before bending the arms, you can generally hide the wrist articulation in various arm poses. A key horror icon of the 80's/90's with decent posability, great sculpt, and properly sized pins - finally - makes for a great addition to the shelf. You'll be able to find a number of different poses using the different hands, although a few more accessories would have gone a long way to increasing the fun. Most sixth scale figures of this general quality are going for $200 - $220 right now. Hot Toys was trying to drive things up into the $250 and above range for awhile, but there's been enough market competition and push back by collectors to keep things in this slightly lower range...for now. ThreeZero is coming in slightly below that at $190 - $195, making this a slightly above average value. Most people will probably think $180 would have been a more appropriate area, but the complexity of the outfit, especially those pins, makes for a higher unit cost. If you pop the head off, you're going to have to be particularly careful putting it back on. I was able to do it by squeezing the head very tightly at the ears, but it wasn't easy. Avoid it if you can. I also unhooked the three metal hooks at the back of the head to allow for greater mobility in the neck. However, getting them back on was not easy, and you might want to think twice about it. I'm glad I did, but others might be perfectly fine with the straight ahead stare you get right out of the box. This figure has been a long time coming, and will look fantastic with your Jason, Freddy, Michael, and Leatherface on the shelf. 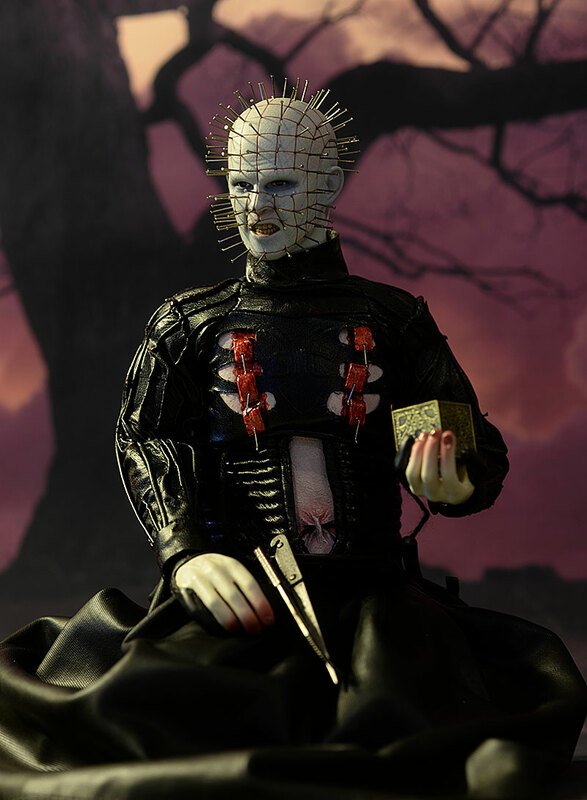 Even friends who have never seen any of the many Hellraiser movies will know who Pinhead is, and the work on the pins and the leather costume makes for a great looking figure. Of course, it's also been way, way too long since we got sixth scale releases of those other 80's horror icons. Sideshow has a new Jason coming, and I hope we see the others get updates soon as well. Until we do, this guy is going to outshine the older releases on your shelf. - has him in stock for $190. - has him in stock at $195. - Entertainment Earth is also at $195. 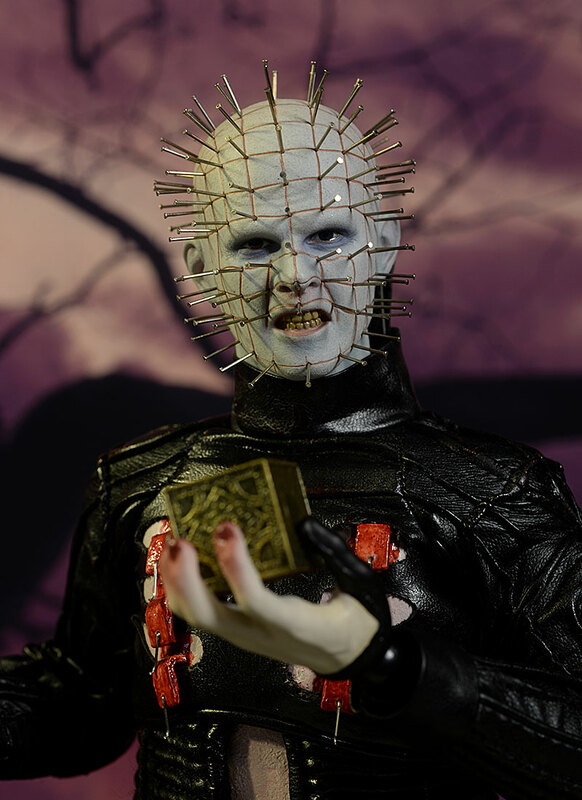 Other Pinhead reviews include the recent Mezco release, as well as the Premium Format statue from Sideshow. 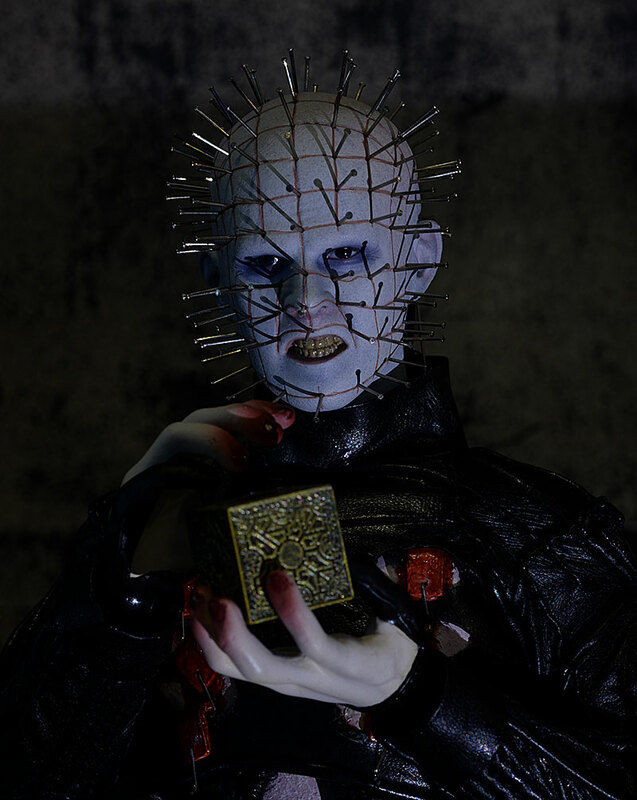 Many years ago, NECA did a series of Hellraiser figures, including Pinhead, Barbie, Skinless Julia, Skinless Frank, Dr. Channard, Bloodless Twins, Butterball, Surgeon, Angelique, another Pinhead, Chatterer, Chatter Beast, CD, Wire Twin, and Stitch.